"When I first purchased this calendar, I was just looking for a nice looking calendar to include on my website. I have since discovered the many possibilities of this little calendar. If there is anything that you need to do that requires date or time functions, this calendar can do it. These guys have thought of it ALL!" "This is exactly what I was looking for. I must tell you that I was very impressed with the level of service you have provided me. It is not everyday that we have the chance to witness such a high quality customer service." "I am thoroughly impressed with the control!!! I have been writing code for a long time and have never seen anything close to this in its ease of implementation, customizability (is that a word), or superior documentation. I integrated it into a server side ASP.Net composite web control in just a few hours. Now my team can add your control to the web app with just a single call to the constructor of my composite control passing in the selected date and min and max values. Perfect!" "Este es un modo muy atractivo de usar vuestro programa: como agenda diaria en el Active Desktop de Windows." "Very nice product, I'm an asp.net developer and I'm shocked how it works well compared to other products I tried." "Thank you, I went ahead and just processed the order with your online account. I hope this will work out perfect for us, I liked the look so much I didn't wait to install the eval - it looks really nice!! And when I can enter database info into it - that sold me!!" "I tried out your PopCalendar on Internet Explorer 5 & 6 and found it extremely wonderful. 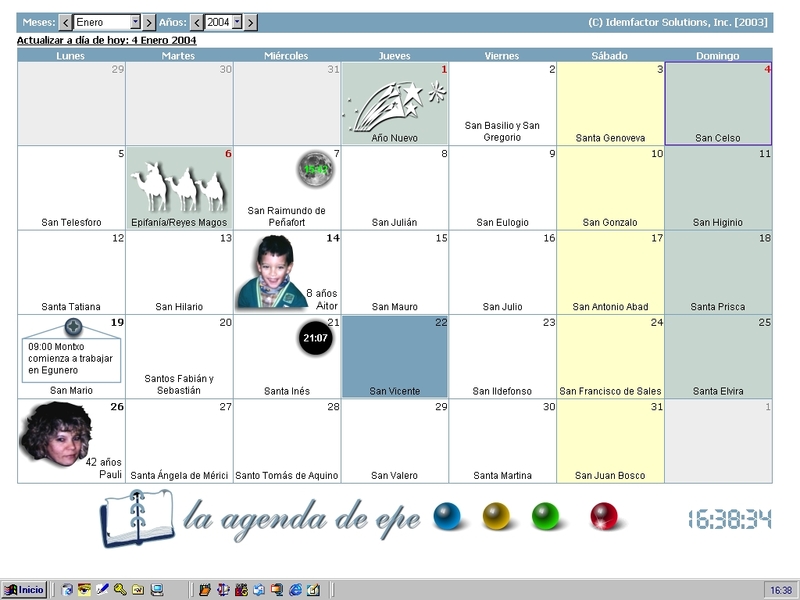 In my 7 years of software development career, I have not seen such a customizable and wonderful calendar." "This is fantastic, i can't belive what you created here. It is profoundly better than anything else i have ever seen way to go!!!!" "Awesome job with the pop calendar!!! Never seen anything sooo sweet!!!" "Awesome calendar! I spent the last few days searching for calendars and yours is the most complete, most configurable, and best-coded calendar...by far!!" "Hey, great work. I've put your calendar on my desktop. I'm *very* impressed with your .js work." "Wow!!! I really LOVE this marvelous calendar!! "I don't speak english. I would just your EXCELLENT clock !" "Hey I forgot to commend you! Fantastic looking calendar and very responsive! It is a the pinnacle accomplishment of pick pickers and all should aspire to your architectural principals. Simplicity is a design goal in coding, but to achieve such aesthetic purity at the same time is divine." "I decided that I would prefer to use popcal for my needs. Thanks for such a great program. If I ever use it commercially, I will be sure to pay you for each website I use it on." "It was love at first sight when I saw your PopCalendar at earthweb.com. It is perfect!" " Very cool, but more than that, it beats all the others I've seen. Great job!!" " Great man! It does the job perfectly, and looks good too. I have seen a few other calendars, but they look very pedestrian compared to yours. Yours stand up there along with the best of them." "Good job my friend. I was searching all over the net to find something like that. Good thing I found it." "This is indeed the best date picker I have come across. I have seen some of you other work and I have to say you are one of the best I have seen. Keep up the excellent work." "OK, I am VERY impressed. This is so cool. I couldn't wait to get it out there." "We are looking to use a date picker control in a commercial application, and yours has the best UI I've seen so far."